Welsh meteorologist who began in the late 1960's drawing attention to the buildup of carbon dioxide in the earth's atmosphere and its result of global warming, now known as the greenhouse effect. Any successful international negotiation for reducing emissions must be based on four principles: the precautionary principle, the principle of sustainable development, the polluter-pays principle and the principle of equity. The strength of 'contraction and convergence' is that it satisfies all these principles. ~~[Houghton did NOT write]~~ Unless we announce disasters, no-one will listen. 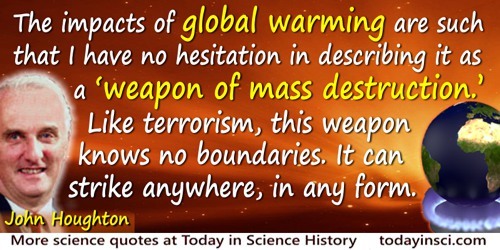 This IS NOT written in his book Global Warming: The Complete Briefing (1994). Houghton has explicitly denied writing it, saying it, or even believing it, in Steve Connor, 'Fabricated quote used to discredit climate scientist', The Independent (10 Feb 2010). Perhaps the earliest example of this being falsely quoted is by Piers Akerman, in a Australian newspaper, The Sunday Telegraph (Nov 2006). Spreading virally, climate change skeptics now gleefully repeat the false quote, without verifying it. 30 Dec - short biography, births, deaths and events on date of Houghton's birth. Global Warming: The Complete Briefing, by John T. Houghton. - book suggestion.